Last weekend The Block Sky High delighted fans with its much awaited open for inspection event. As predicted, thousands of people flocked to South Melbourne’s Park Street, for what was more like a festival than an open house. 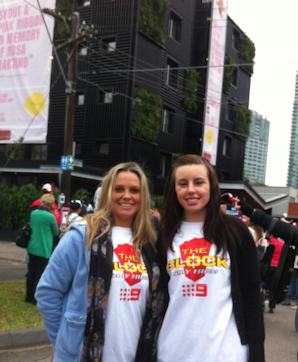 The 2012 season of The Block, also located in South Melbourne, brought in a crowd of 20,000 people, and Sky High attracted similar numbers. This year’s two day event (13-14 July), offered spectators the opportunity to meet their favourite judges and contestants and browse a range of stalls and activities, but the real highlight was the chance to take a first hand look at apartments they’ve watched evolve over the last two months. The keenest fans joined the queue Friday afternoon and camped out in tents overnight, while others sat on the concrete and simply went without sleep. In the middle of a Melbourne winter – that’s what we call dedication! Kayla from Dandenong North estimated that herself and friend Leonie waited a staggering 7 ½ hours to take a look at the apartments – with absolutely no regrets. “It was jam packed, we got there at 8 o’clock in the morning – I read on a news site that some people got there at 3.30am the last year so I wanted to get in there early – but I didn’t want to get there at 3.30!” she said. A new fan to The Block series, Kayla explains that what attracted her to the hit reality-reno show wasn’t just the drama of the high pressure situations contestants were placed under, but also the information and the real life skills viewers can pick up from watching it. When asked which team she thinks will win The Block Sky High, Kayla’s money’s on Johnno and Trixie’s penthouse. “My favourite team kind of changed, at first it was everyone’s favourite, Alisa and Lysandra, the twins. Towards the end of it my favourite was Matt and Kim,” she said. But after viewing the apartments in person, she thinks Johnno and Trixie will be take home the $100,000 prize. “Their permanent fixtures like the tiles and the lights and the painting, everything was done really nicely compared to the other apartments. The other teams spent less time worrying about permanent stuff and more time on jazzing it up”. According to Kayla, “there’s a big difference from what you see in reality to what you see on TV. There were a few things, like painting around light switches; you could see brush marks and things like that”. Kayla expects that these differences in quality and attention to detail that are likely to have a big impact on the final result of The Block Sky High. “If you’re paying millions of dollars for an apartment and you look at the quality of Johnno and Trixie’s compared to the quality of everyone else’s, it’s not anywhere near as good. “Johnno and Trixie said they spent a lot of time on their finishes – and on TV, that’s what was kind of their downfall. But when you get in there, their finishes are amazing. The quality is so much better than anyone else’s. Property Style and Goss > Who’s Going to Win The Block Sky High?